Battambang has a surprising range of great eateries. 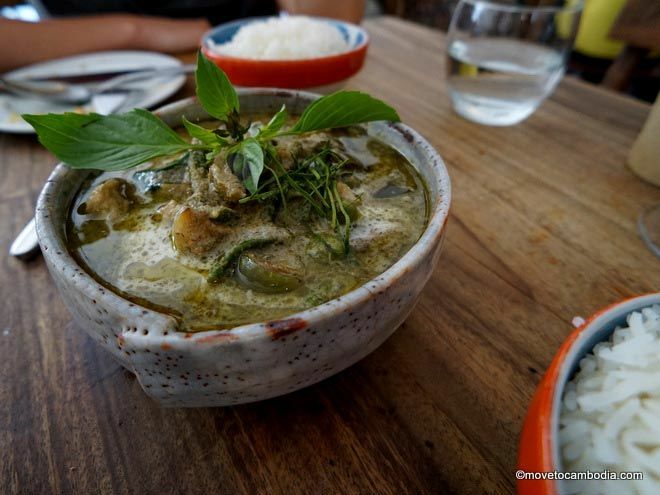 These are our favorite Battambang restaurants. Jaan Bai has lots of veggie options and excellent cocktails. You can’t go wrong. If you only have time for one meal in Battambang, let it be eaten at Jaan Bai. Jaan Bai (“rice bowl” in Khmer) is an excellent social-enterprise restaurant run by respected Cambodian children’s charity CCT. They provide training and employment for young people in their program. They also serve up a mean bowl of curry. Jaan Bai’s menu features modern Khmer dishes made from local, seasonal produce and lots of tasty vegetarian options–try the spectacular potato, corn, and tomato curry. The perfectly crafted cocktails with an Asian twist are not to be missed. Open Tuesday to Sunday, 11 a.m. to 10:30 p.m. If you’re looking to try a range of homestyle Cambodian dishes in a low-key environment, look no further. Battambang Town Restaurant is a large, breezy restaurant packed with sturdy wooden tables and offers an extensive picture menu of classic Cambodian dishes, with several types of whole fish (served on fish-shaped platters) and soups (served in steaming tureens with charcoal to keep them hot). Everything is reasonably priced and made just the way your Cambodian grandma would make it. Open for breakfast, lunch, and dinner, this art cafe owned by a French-Khmer couple is renowned for homemade breads and French-inspired desserts made with high-quality ingredients. The simple menu features sandwiches, omelets, and crepes, but even if you can’t fit in a meal, it’s worth coming over just for dessert and a drink. The chocolate mousse gets great reviews and is always on the menu, as is their special chocolate hazelnut cake, plus daily dessert specials, all of which are sure to satisfy even the most discerning sweet tooth. The best coffee in Cambodia? You be the judge. 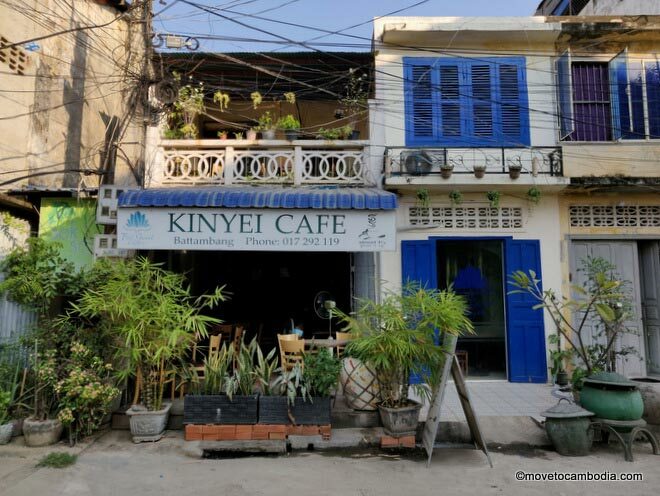 Combination coffee shop, art gallery, and co-working space, Kinyei serves what one local expat declares is the country’s best coffee. We don’t feel qualified to be the judge of that, but the shop, which is run by the team from Feel Good in Phnom Penh, is definitely the best in Battambang. Plus, the breakfasts are good and the cakes are tasty. 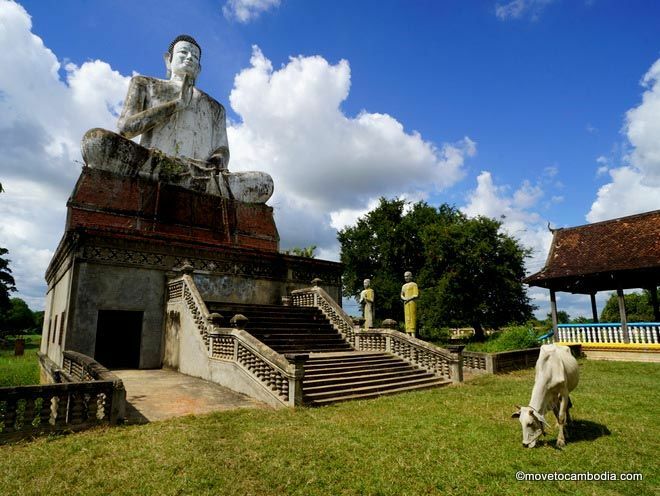 Kinyei is also home to Soksabike Tours, and you can rent a bicycle there for $2 per day. In addition, Kinyei is a space for social entrepreneurship that provides support for small social ventures, innovative products, and creativity. It’s a cool little place to hang out, do some work, and meet locals who are doing interesting things. Known for having some of the best pizza in Battambang, La Casa is a slightly upmarket Italian restaurant (by Battambang standards), but without the pretense of some of the town’s other higher-end restaurants. Just opposite the Royal Hotel on Road 115 (near Psar Nath), La Casa offers a large selection of pasta and pizza dishes in a relaxing street-side setting. Dishes average between $7 and $10 and expats rave about the shrimp. This family-run noodle house may not have a lot in the way of ambiance, but they serve a mean bowl of noodles, which they make fresh every day. 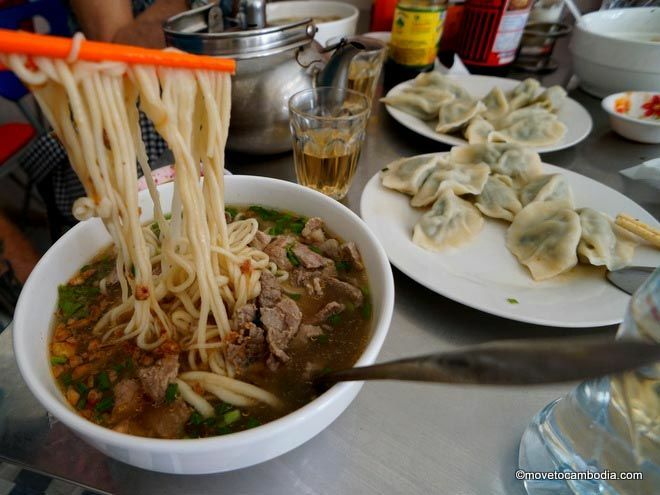 The menu is small and inexpensive, featuring an array of hand-pulled noodles served dry or in soup, yummy homemade dumplings, and fried rice. Most dishes are 5,000 or 6,000 riel ($1.25 or $1.50) and are so good you might want to order more than one. Any expat in Battambang will tell you, the pizza at Riverside Balcony is top notch, and with its riverside setting is a favorite spot for enjoying a sundowner. They have a menu of gastropub-style bar snacks, in addition to daily specials and gourmet pizzas starting at $5, with creative toppings on delicious thin crust bases, ranging from the usual margarita and Hawaiian to more unique offerings. Madison Corner and Madison Bar are run by Patrice, one of Battambang’s French residents, who opened the first Western restaurant in town, and seems to know everyone who lives there. The inexpensive menu at Madison Corner has a variety of burgers, sandwiches, and Khmer dishes. They’re open for breakfast, lunch and dinner and you’ll often find what feels like all of the French speakers in town out front, practicing conversing in their native tongue. Scenically located on the banks of the Sangker, The River has an extensive and inexpensive menu of Khmer and Western dishes for between $2 and $4. The restaurant is open for breakfast, lunch, and dinner, although sunset is a particularly nice time to enjoy the view, and if you want a sundowner, draft beers are only $0.50. Vintage is constantly evolving, and so is their interestingly unique and eclectic menu. The offerings include a small selection of simple sushi rolls, and Western and Cambodian dishes. A personal favorite is the sharing platter with a selection of meats and cheeses, which goes well with the broad selection of wines available by glass and bottle. 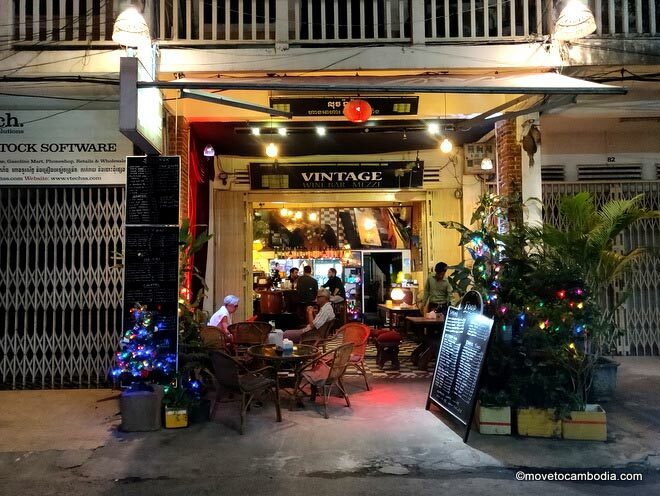 Vintage is a relaxing place to wind down in the late afternoon or evening, and ideally located on Road 2.5 for watching the world go by with a glass of wine. And if you decide to stay for dinner, all the better. Both their Western and Asian dishes are very nice, if a bit more expensive (averaging $3 to $9) than some of the other places in town. Be reassured that the portions are large and the quality is good, so the price is worth it. Cafe Eden offers large portions of American-style dishes, from Philly cheesesteaks to Texas toothpicks (beer-battered fried onions and peppers with jalapeno ranch dip). “I’m American,” the owner told me, summing up her credo for the cafe. “I want free water with refills and a choice of salad dressings.” And you’ll get just that, plus great service and lots of sauces on the side. Eden is run by a Christian missionary group with the profits going back into staff training and local services. They also have a small boutique on site that sells hand-crafted products and T-shirts. Open for breakfast, lunch, and dinner, with happy hour from 3 p.m. to 7 p.m. every day. Open daily, except Tuesdays, 7:30 a.m. to 9 p.m. Rising from the ashes of the former Pomme d’Amour, the current Pomme really has nothing to do with its predecessor, other than the name. The new incarnation is a backpacker joint (there’s a hostel upstairs), as is reflected in the menu, which features an array of mostly Western fare. That includes a build-your-own burger or hot dog, salads, a baked potato menu, and a nightly grill as well as daily specials. Bonlai means “vegetables” in Khmer and, as you might guess, the owner, a former chef from acclaimed Battambang restaurant Jaan Bai, is a die-hard veggie eater. When we visited, there was as yet no sign up and no staff, and the chef-owner was running the place as a one-man operation serving up vegan pizzas. All of which led us to not expect much from the place. How wrong we were! We tried the potato-and-caramelized-onion pizza with roast garlic and arugula on a tomato base, and it was so delicious we didn’t even notice the lack of cheese. There are seven types of pizza on offer, and each costs $6 for a hearty pie. This little hole in the wall is tucked away near Monorom Garden, and if you blink you might miss it. Not very glamorous, Vegetarian Foods Restaurant seems to appeal to locals and the more adventurous vegetarians in Battambang. The menu features an array of mostly Chinese-style vegetarian food, much of it made with soy faux-meat products. Dishes are inexpensive, costing between 4,000 and 5,000 riel ($1 to $1.25 USD). They also make their own fresh soy milk every day in several flavors. Bar Ang is a new bar and restaurant that is in location that was previously Chenda’s, opposite Lux Guesthouse. Vegetarians will be happy to hear that plant-based eating is still a focus, and the menu still provides a broad range of options for non-meat eaters. 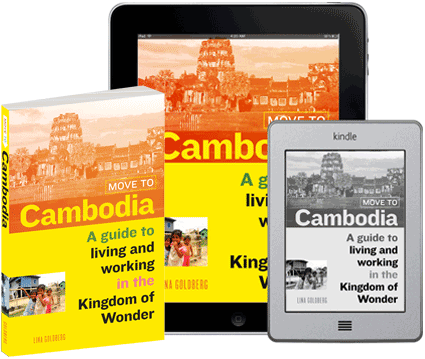 The menu features both Western and Khmer cuisine, and all dishes can be made with meat or without, and features both vegetarian and vegan options. Dishes are generally priced between $3 and 5, and draft beer is just $1. Inside there is an air-conditioned room, but the other tables also have a fresh and airy feel to them. The food is up to the high standard of Ambrosia, and service is friendly and efficient. This clean, well-decorated vegetarian restaurant that has been in town for many years, though they recently renovated and changed their name from Mercy House to the much more appealing Monorom Garden. The vegetarian menu is mostly Asian-inspired cuisine, with Korean and Japanese dishes such as stone-pot meals and teppanyaki, alongside more traditional Cambodian specialties like basil fried rice and a vegetarian lok lak. 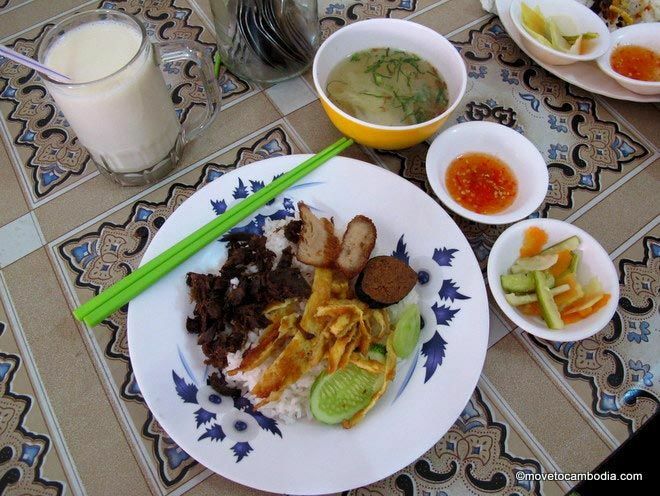 The best way to start your morning is with Cambodian pork and rice. This may not be the very best bai sach chrouk you encounter in Cambodia, but it’s worth a visit if only to sample the smoky, chili-flecked green mango salad that comes along with the chopped grilled pork, fried egg, and standard pickled cucumbers and carrots. The friendly proprietor sets up shop in the morning outside of her house on Street 2.5 and doesn’t speak a word of English, but responds bemusedly to the basic point-and-smile approach. 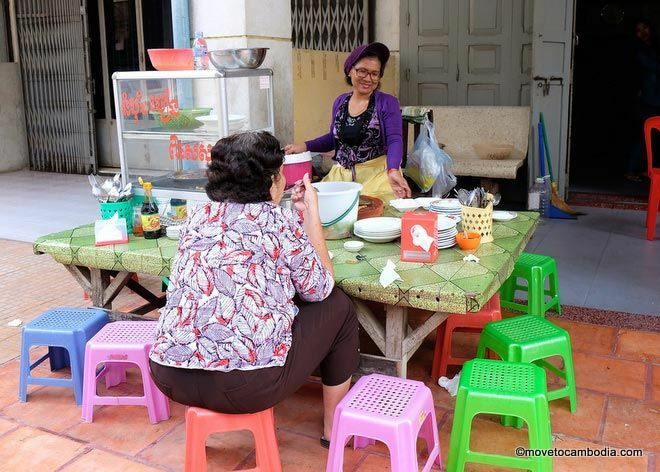 If this stall doesn’t work for you, there are a few more streetside eateries just around the block. Bai sach chrouk with all the fixings goes for about 5000 riel.